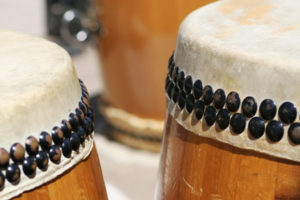 To prepare for our upcoming California WorldFest debut, we are raising funds to replace the heads on several of our drums. We want to leave our impression at the WorldFest stage with the deepest thundering sound possible and that’s where we need your help. We have drumheads soaking, stretching and drying at this very moment in the dojo, thanks to all of our supporters. But we still need more! It’s not too late to contribute and we still have some great perks leftover from our IndieGogo campaign, from t-shirts to California Worldfest passes. Contribute, grab a perk and come here us play at Worldfest! Click the “Support” link at the top of this page or contact us, info@grassvalleytaiko.com, to find out more about the perks!